What is ZO® Radical Night Repair? 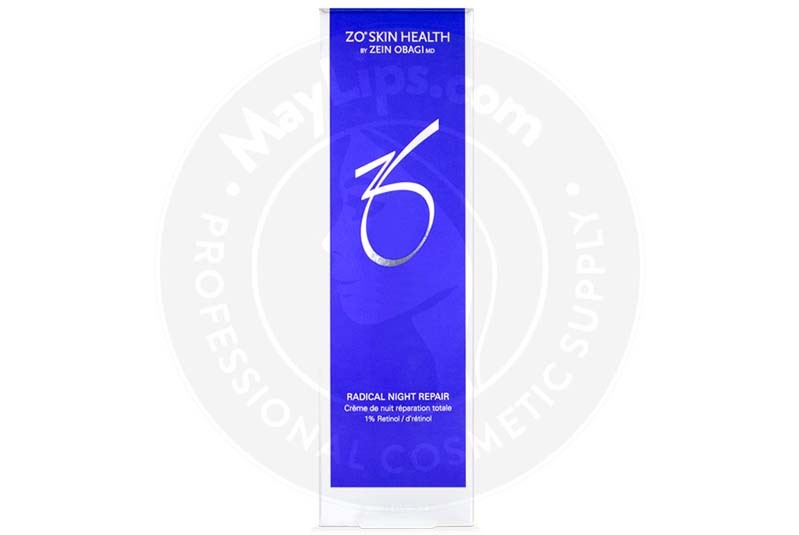 ZO® Radical Night Repair is a potent skin treatment that contains 1% retinol and is manufactured by ZO® Skin Health, Inc. This skin treatment is suitable for patients that have skin problems, such as age spots. Beside retinol, this advanced radical night repair solution also contains vitamins E, C, and A, glycerin, herbal extracts, and plant stem cells. All these ingredients combined help stimulate cell turnover, offer antioxidant protection, and reduce skin irritation. This intensive formulation helps to reduce signs of ageing such as age spots, while improving the skin’s brightness to provide a more even tone and texture. 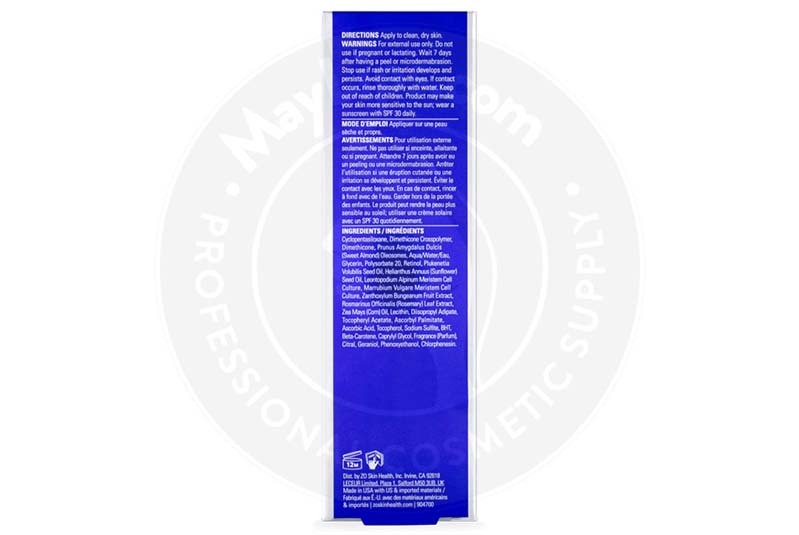 This advanced radical night repair comes in a package with 1 tube fitted with a pump, containing 60mL of the gel. The gel should be stored at a controlled room temperature, between 15 to 30°C. You may recommend ZO® Radical Night Repair to patients with signs of sun damage and brighten the complexion. The high concentration of retinol in the formula specifically targets UV skin damage and brown spots. 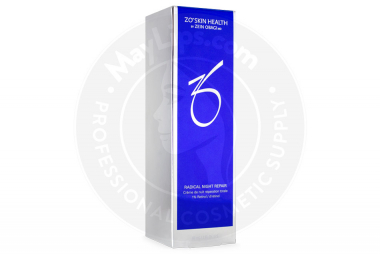 This cream helps stimulate skin cell turnover while reducing irritation. It also offers antioxidant protection to the patient’s skin. The main component of ZO® Radical Night Repair is encapsulated, high-potency retinol, which helps stimulate cell renewal and collagen production. Other ingredients of this gel include sichuan pepper fruit extract, rosemary leaf extract, and sunflower seed oil which help calm and soothe skin irritation while reducing redness and inflammation. This creates a more even and youthful skin tone. The plukenetia volubilis seed oil and the glycerin in this advanced radical night repair solution help to reduce skin dryness, restore the protective barrier of the patient’s skin, and rehydrate the skin. Essential vitamins and plant stem cells provide antioxidants and help protect the patient’s skin from premature ageing and damaging free radicals. How should ZO® Radical Night Repair be used? Your patients can use this retinol treatment twice a week, half an hour before bedtime. Before use, patients should thoroughly clean and dry their face. Gently and slowly massage into the skin, covering the entire facial and neck area, while avoiding the eyes. After the first use, the patient’s skin may be a little dry and start peel. This is a natural reaction and should resolve on its own. The patient can gradually increase use to nightly. This advanced radical night repair gel is an effective and a totally safe retinol treatment, if used as per the instruction manual. Advise your patients to avoid this treatment if they have any known allergies to any of the ingredients of the product. This retinol treatment is not recommended for patients who are breastfeeding or pregnant, as well as for patients who are taking any prescription acne medications. Advise your patients to limit sun exposure and to always use a sunscreen, as the treatment may cause sun sensitivity. This treatment is for external use only, so patients must be careful not to let the gel get into their eyes. If this happens, they should immediately rinse with water. There are no known severe side effects that may occur when using this retinol treatment. Some minor side effects may occur for a few days following the first application of the gel, and these reactions usually resolve on their own. If your patients experience an allergic reaction they should seek medical assistance as soon as possible. Glycerin and plukenetia volubilis seed oil restore skin hydration to improve the appearance of dull and dry skin. Name: ZO® RADICAL NIGHT REPAIR. Ingredients: Cyclopentasiloxane, Dimethicone Crosspolymer, Dimethicone, Prunus Amygdalus Dulcis Oil, Glycerin, Polysorbate 20, Water (Aqua), Retinol, Cyclotetrasiloxane, Diisopropyl Adipate, Plukenetia Volubilis Seed Oil, Oleyl Alcohol, Phenoxyethanol, Tocopheryl Acetate, Helianthus Annuus Seed Oil, BHT, Chlorphenesin, Leontopodium Alpinum Meristem Cell Culture, Marrubium Vulgare Meristem Cell Culture, Zanthoxylum Bungeanum Fruit Extract, Sodium Sulfite, Caprylyl Glycol, Ascorbyl Palmitate, Gluconolactone, BHA, Rosmarinus Officinalis Leaf Extract, Sodium Benzoate, Lecithin, Xanthan Gum, Parfum, Tocopherol, Ascorbic Acid, Zea Mays Oil, Beta-Carotene. 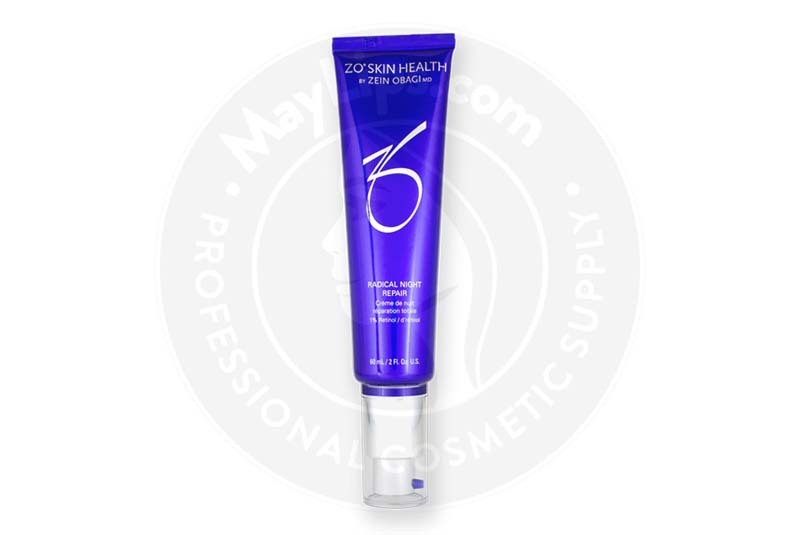 Size: Tube with pump, 60 ml (2 fl oz).